When most people think about breaking up or ending their marriage, they think about living separately. In today’s economy it isn’t always possible to get that physical separation immediately. The spouse who plans to move out might need time to find a place to stay or to put together enough cash to afford a new place. Some couples who own homes find that it isn’t financially feasible for anyone to leave because of a high mortgage payment or equity that is so low that the home cannot be sold without a huge loss. In these situations, you’re stuck together under the same roof. While your kids might be happy no one is leaving just yet, it can be hard to live together when you have decided you are no longer a couple. Use these tips to manage the situation so that it doesn’t have a negative impact on your children. Even though you’re living together, it’s still a good idea to start scheduling parenting time now. It may be uncomfortable for you (and for your kids) to do family activities together because of the stress of the situation. If you start to create a schedule of separate times with the kids now, it won’t be as difficult an adjustment for your children when one of you does move out. If you’re going to be roommates, act like them. Set up schedules for chores and rules about personal space. Write them down to make it clear. This will reduce conflict and help your children feel less stress. 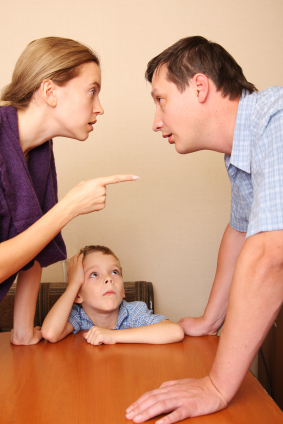 Whenever possible, put the brakes on arguments until you can speak freely out of your children’s hearing. Yes, you have a lot of things to work through and you probably have a lot of reasons for hurt feelings, resentment, and anger. But living in a home filled with shouting and recriminations is enough to make any child stressed, so keep it to a minimum. If you try to pretend nothing has changed, your kids will be suspicious. Sit down with them and tell them the truth. Explain that you are getting a divorce (or a separation, or that you are taking a break) but because of money have to continue to live in the same house for now. Explain how things will be changing for everyone in the family and especially what this means for your children. Be clear about what the ultimate plan is (two separate homes). Mentally or physically, you need to find a way to separate from each other within the house so you can think clearly, avoid conflict, and adjust. Whether this means separate bedrooms, taking turns in the kitchen, nights off for each parent to get out of the house, or some clear boundaries about privacy when it comes to closed doors or personal belongings, you each need room to begin to see yourself as an individual. This kind of living situation works better for some couples and families than others. If you find that the situation is just making everyone miserable, you have to make alternative arrangements, no matter how expensive or difficult they might be. Brette McWhorter Sember is a retired family attorney and mediator and nationally known expert about divorce and parenting after divorce. She is the author of The Divorce Organizer & Planner (McGraw-Hill), How to Parent With Your Ex: Working Together for Your Child’s Best Interest (Sourcebooks), The Complete Divorce Handbook (Sterling), and No-Fight Divorce: Spend Less Money, Save Time, and Avoid Conflict Using Mediation (McGraw-Hill). Her web site is www.BretteSember.com and she blogs at www.SolveDivorce.com.